Guinea pigs are great pets to have around the house, and they’re even better as first pets for kids, being easy to contain and living up to nine years. To make sure your guinea pig lives a long, happy, and healthy life, learn the signs of illness and the most comment ailments they face as well as how to treat them. They can be difficult to spot since, as prey animals, guinea pigs hide signs of illness, but if you know what to look for, you may still be able to spot the signs and treat your furry friend. Respiratory disease, especially pneumonia, is a common killer among guinea pigs, with bacterial kinds of pneumonia being the most common. However, a guinea pig may come down with the disease due to an adenovirus. Symptoms include sneezing, nasal discharge, fever, breathing issues, appetite loss, and conjunctivitis, also known as pinkeye. Take your guinea pig to the veterinarian as soon as possible if he or she displays any symptoms. 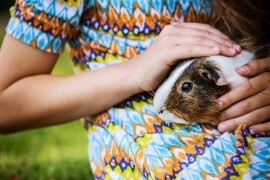 Infections caused by pneumonia-like symptoms can be deadly, but treatment can prevent an early respiratory illness from turning into full-blown pneumonia and ultimately save your guinea pig’s life. Guinea pigs do not have a gag reflex, so diarrhea is the main symptom of any gastrointestinal disorder. Your guinea pig may become dehydrated from fluid loss and may also stop eating and become lethargic. In severe cases, a vet can provide guinea pigs with intravenous fluids. To prevent diarrhea, it helps to add more roughage to your guinea pig’s diet. Make sure he or she constantly has grass or hay available as well as clean, fresh water. The hay helps to keep the gut moving and helps to wear down teeth and prevent dental disease. A guinea pig’s teeth continuously grow throughout his or her life. If the guinea pig doesn’t have enough fiber in its diet, which comes from hay, its teeth do not wear down correctly, which can cause malocclusion or tooth misalignment. Guinea pigs that struggle with this may drool and have difficulty chewing food properly. A lack of vitamin C is also something to look out for in guinea pigs since they cannot produce vitamin C on their own, making them more susceptible to dental disease. They can develop abscesses in their tooth roots that eventually spread an infection to other parts of the body. To treat this, your vet can file your guinea pig’s teeth and recommend the right diet for him or her. In addition to medical treatment, minor scrapes and cuts can be tended to at home. Even minor wounds can become problematic, so it’s important to never hesitate to make an appointment as soon as possible with your guinea pig’s vet. To clean a minor cut, first clean the wound with a water based lubricant. Make sure the area is clean and dry, and then apply a non-stinging antiseptic solution, such as Chlorhexidine, to the area. Then, apply an antimicrobial ointment or medical grade Manuka honey. Try to prevent your guinea pig from grooming the area and change the bandages at least twice a day until the cut is healed. You can also ask your veterinarian about including Manuka honey into your guinea pig’s diet.